Not everything is always good the first time. When an artist puts out a piece of art, remember you’re only seeing the final version that they’re comfortable showing. You don’t see all the struggles of making it. I struggled a lot with this barrel. Even in the end I believe it’s one of the weaker pieces, but good enough to fit. I first started by drawing the rim and bottom then tried to draw the middle of the barrel around that. As you can see, that was a huge mistake. It didn’t look like a barrel. I tried to fatten it up, bit it still looks very strange. So I scrapped it. Started instead with a cyllinder, made it a bit rounder, and started adding details. This was definitely getting closer, but still not perfect. After shading it I felt it was still too fat and round so I made it skinnier and taller. Then after putting it into my scene it felt like I overused the black and it stood out to much, so I reduced the amount of black. Then in the final one I made the rim skinnier, I don’t know why I felt the need to make it so big in the beginning. The trick is to not add too much detail, and not have too little. It’s a balance that you need to find through practice. You always want to add just enough texture to suggest that the texture covers the whole area, but not so much that the simplicity gets lots or you lose readability (an extremely important part of pixel art). A big thing is you don’t have to draw every single line. Sometimes the line is just too thin and you just don’t have the space. And two objects that share colors may touch and seem to merge into one, but that’s okay, as long as you suggest that there is separation, the viewer will see it. I try to not make the details I do add completely random/bland. A lot of the places with details have cracks or some other defect. Because if a person was looking at a wall, there eyes would dart around the room. If it was a wall of perfect bricks, it would kind of all merge together. If a few things stick out, your eyes dart there and you get some of the detail around it as your brain looks at it for a second. So you’re drawing all the parts that a viewers eyes would see when taking a quick look, and leaving everything else out. Does that make sense, or am I a crazy person? Sometimes I start with a blank wall and slowly add details one by one, that’s what I did with the walls and floors (using a grid). Sometimes I draw in all the details and then take stuff away. I did that with the books, started as a uniform line of perfect books, and I removed them, changed the widths, colors, removed parts of some lines, and just kept working it until I had something I liked. I just want to remind everyone, isometric is an angle, not a style. Far too often people pigeonhole it into saturated colors and black lines. While that style can be nice, it’s not the only way. 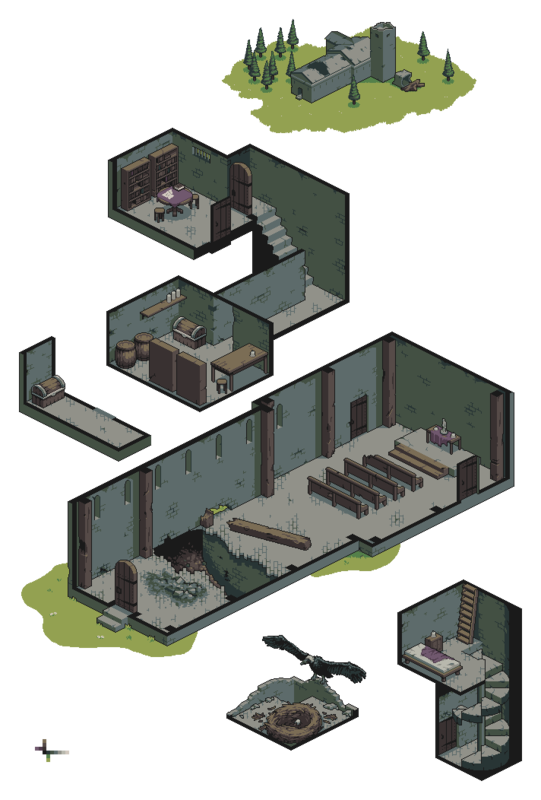 The piece that inspired me to even consider doing isometric was In A Middle of Nowhere by Fool (he’s good at pixelling, not grammar). Just an afterthought, but just starting this piece seemed really daunting. I’m always afraid and don’t know where to start, so I usually make a tiny palette and try to do a little drawing, adjusting as I go. This time I looked for other pieces and found Dungeon Entrance by Goodlyay, and fell in love with the colors, so I “borrowed” (stole) them, then added a few of my own as I needed them. Having such a solid start was a huge boost, and really kept my confidence up throughout the piece. A palette can make or break a piece. Well, it can’t make bad pixelling good, but it can certainly make good pixelling bad. There’s also something to be said about having the right amount of colors. Luckily during this piece I never felt like I needed another color, or didn’t know what one to use. MEASURE THINGS BEFORE YOU MAKE 50 COPIES OF IT. I can’t tell you how many times I copy-pasted something and the realized every other is a different length. Measuring was the hardest part, but I tried to be as accurate as possible. I used tons of grids tried to keep everything uniform. Measure twice, pixel once. It’s also important to keep everything in the same scale. I started with 1×1 foot grid on the ground and based everything off that, trying to imagine it’s real size. Even measured some things in my house with a ruler to compare. Even the best artists struggle. 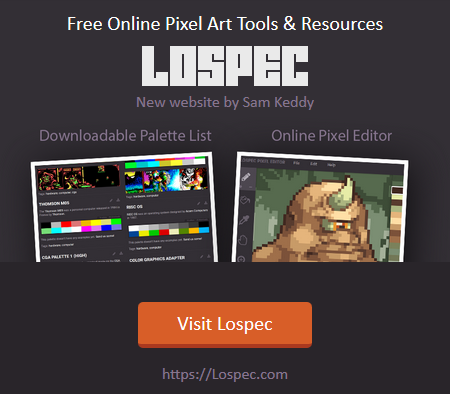 The great part about pixel art is how forgiving it is. You can so easily make a copy and try things out that it removes a lot of the pressure, unlike a painting or drawing where you get one shot. It’s nice. I was really worried I was going to screw up the nest so I didn’t work on it for a few days. Now it’s one of my favorite parts. It is going to end up bigger than you think, and take much longer.